All you need to grow your own kitchen garden - this makes a lovely gift for family and friends, presented in one of seedballs perfect gift boxes! You will receive three tins, one each of Salad Mix, Herb Mix and Tea Mix. 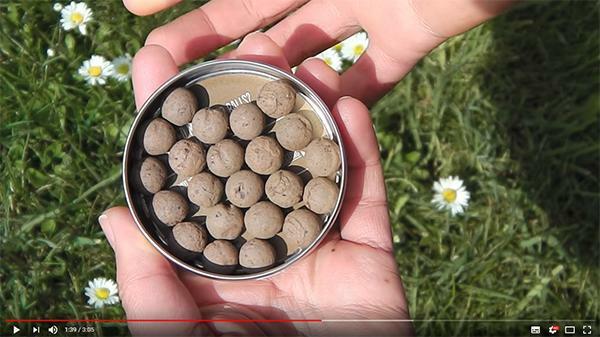 There are 20 balls per tin, 30-100 seeds per ball. Salad Mix:A selection of delicious frilly salad - cut and come again! Cress (Greek - Lepidium sativum) A versatile salad item with a nice peppery flavour. Kale (Red russian - Brassica oleracea) Kale is also one of the most nutritious leafy vegetables you can find. Packed full of vitamins, antioxidants and iron! It can be eaten raw (best when leaves are young or steamed) or added to stir fry recipes. Mustard (Green frills - Brassica juncea) Spice up your salads and sandwiches with these bright green shoots which become serrated as they grow. Mustard (Red frills - Brassica juncea) The attractive and sweet leaves are finely serrated when young. The burgundy-red leaves add the taste of mustard and horseradish to salads, stir fry recipes and sandwiches. Salad rocket (Dentellata - Eruca vesicaria ssp. sativa) A lovely peppery flavour to salad, the younger leaves are milder, more tender and palatable. Anise (Pimpinella anisum) Anise preparations are a fantastic treatment for asthma and a bronchitis cough, in addition to digestive complaints like bloating, colicky stomach pain, nausea, and indigestion. Chamomile (Anthemis austriaca) Brew a cup of fragrant chamomile tea to enjoy so many chamomile tea benefits! This herbal tea eases insomnia, boosts your immune system, banishes menstrual cramps, and much, much more! Mint (Mentha rotundifolia) Mint tea is a delicious and refreshing way to boost your overall health in a number of ways, due to its ability to improve digestion, reduce pain, eliminate inflammation, relax the body and mind, treat bad breath, aid in weight loss and boost the immune system.